The present article aims to give an overview of indigenous rights in Andean Constitutionalism, focusing on how Bolivia included the concept of Interculturality in its Constitutional Charter through the incorporation of indigenous ancestral concepts, such as the Suma Qamaña (Buen Vivir or ‘Living Well’) principle. In addition to a brief academic analysis, I had the opportunity of interviewing Victor Flores, a Bolivian who has lived in Dublin since 2013. I asked him what is his real perception about the reality of his country as a Bolivian, reflecting on the fact that maybe the Constitution is not all it seems. Even before the debate on Interculturality and Indigenous Rights took place, the Andean Region was the cradle of ancestral indigenous precepts like the Aymaran principle of Suma Qamaña or vivir bien (living- well) and the Quechua Sumak Kawsay or buen vivir (good-living). Starting from an approximate definition, these two similar principles identify a way of life in harmony with nature and with other people in accordance with the indigenous cosmovision, where everyone is connected and is a part of a whole. Buen Vivir or Vivir Bien means living in the community in a complementary and sharing way, living in harmony not only with other human beings but also with nature, it means more than living-well: it means to live fully (vivir en plenitud). In accordance with this vision, Earth is perceived as a social and inviolable space where humans and spirits meet. For this reason, Earth must be respected and not exploited, in order to avoid breaking this equilibrium between the human and spirit worlds. It is said that if this equilibrium is broken, it could bring about the extinction of humankind. Suma Qamaña derives from the Aymara language – qamaña means “live” and suma “well”. In the Aymara daily practice this principle has two different meanings, one refers to human relationships (tumpasiña) and the other one to public life (thaiki). As regards the one referring to human relationships, we can explain it with the verb tumpasiña, that in the Aymara language expresses the sense of loss of someone we truly became attached to. With respect to public life, the word thaiki expresses everyone’s path to maturity by serving her or his own community. Victor described Suma Qamaña and Sumak Kawsay as “millennial ethical practices passed on orally and materialised in the community so that they can be understood in their practical application”. How? By looking for a balance between yourself, people and nature. This is the reason why Suma Qamaña is an ethic that suggests a daily behaviour that must be observed in one’s own community. The strength of the community always incorporates the individual who, in Aymaran philosophy, is just “Earth that talks”. Victor explained that Suma Qamaña leads us to think of a new world conception and, in particular around its environmental aspects, a new economic model. However, as it has never been written, this is an oral principle. Both the Quechua and the Aymaran People teach through principles, such as aini, that is to say reciprocity, or the minca, according to which community members’ always contribute to working on communal projects. This is the equivalent of the Irish meitheal. Despite the fact that until the ‘90s Latin American Constitutions were inspired by European and conventional legal traditions, today, Latin America can be described as a “Constitutional Lab” where States are experimenting new constitutional models marked by a social, cultural and legal pluralism. Among these, Andean States were the pioneers with Ecuadorean Constitution of 2008 and Bolivian Constitution of 2009. Ecuador and Bolivia defined Pluralism in terms of interculturality, a concept which sees in the meeting of different cultures that compose the State a creative process with the aim to create a connection across cultural and social differences. Whereas, on one hand, the term “Multiculturalism” does not contemplate any inclusion between the different cultures that cohabit in the same reality; on the other hand, “Interculturality” implies a dialogue between them, creating a shared definition of society’s fundamental values. First, the Ecuadorian Constitutional Assembly, then, the Bolivian Constitutional Assembly became the scenarios of this dialogue, whose result was in both cases the constitutional definition of interculturality. In this way, Bolivia constitutionalised traditional local values and indigenous principles. But what does interculturality mean from a practical point of view? Victor reported to me that Bolivia, although it is defined as a Pluri-national state, recognised just 36 indigenous languages and not other indigenous communities, who continue to fight in order to be recognised by their departments (provinces). Moreover, he criticised also that, according to Bolivian law, there must be just seven native members of Parliament and not the 36that are recognised in the Constitution. He said: “Interculturality was already declared in the Bolivian Education Law of 1994, so it’s not as big an innovation as the government wants to show. The capitalist – neoliberal governments made these laws, and the current government repeats them in their own essence”. However, Victor’s voice is not the only one that is critical. The Bolivian sociologist and activist Silvia Riveira Cusicanqui also has a strong opinion. She has denounced that in Bolivia there is no existence of a real interculturality but that there’s still a multicultural reality. This is confirmed by the division into the 36 different ethnic groups, that reinforce the idea that indigenous communities are minorities instead of being the majority (besides, the government list doesn’t mention districts like El Alto or Chapare with large indigenous migrant populations). In her opinion, if we want to think about indigenous culture as the future of the Bolivian state, Bolivia should place more value on indigenous knowledge, starting from agricultural knowledge and philosophy. For example, the use, of tractors on Andean lands as promoted by governmental agricultural policies shows the lack of importance that the Agricultural Ministry assigns to indigenous knowledge, which has never used tractors since they know that the Andean lands aren’t able to sustain their weight. So, Bolivian policies around indigenous groups are still policies intended for a minority population and not for a majority as the reality shows that indigenous people are. 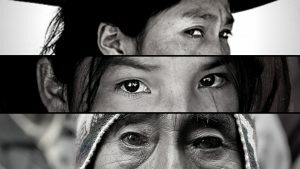 Indigenous people represent the majority of the Bolivian population, so from Cusicanqui’s point of view, in order to reach a real Interculturality the only solution should be an indigenisation of the whole of Bolivia’s society. According to Cusicanqui, the victory of the Movement for Socialism (MAS) with Evo Morales’ election in 2006 and the Constitution of 2009 represented a historical opportunity of indigenisation but the reality shows a Government that just appears indigenous. According to her criticisms, Evo centralized the Bolivian State in order to make it economically stronger forgetting the decentralisation of the several Bolivian indigenous communities. So, at least on a theoretical level, rights started to be applied in a more intercultural way, regardless of the belonging to a specific community, and in the Bolivian Constitution some of the indigenous principles were included, among these, the already mentioned Suma Qamaña. In terms of how the State applied the principle to some of its constitutional aspects, it is considereding the educational and economical ones. Around education, the principle is mainly referred to nature without any reference to its social-coexistence perspective. Article 80 orients education to different aspects, among these, the conservation and protection of the environment, biodiversity and land to ensure wellbeing. As regards the economical aspect, the Article 306 tells that “the Bolivian economic model is plural and that seeks to improve the quality of life and the wellbeing of all Bolivians.” For this reason, to eliminate poverty and social and economic exclusion, and in order to achieve wellbeing in its multiple dimensions, the economic organization of Bolivia defined some objectives like the fair production, distribution and redistribution of wealth and economic surplus, the productive development of the industrialization of natural resources and the active participation of the public and community economies in the productive apparatus. In Victor’s opinion, putting it into Bolivian Constitution was a commendable effort but at the cost of distortions and wrong translations imposed by the Government. Victor pointed out that the real problem is that, first of all, the principle doesn’t correspond to the vision of the state that, now, is represented by the President Evo Morales. The result was the supremacy of interests and politics that aren’t inspired by the Suma Qamaña way of life and the protection of indigenous rights. They lost against interests that connect Bolivia to the world: gas and oil. In Victor’s opinion, Evo Morales was, actually, a campesino, a peasant, and this is very different from being from an indigenous community, even though he used to wear traditional clothes, and often in Bolivia the terms indigenous and campesino are wrongly considered synonymous. The peasant can be considered, a “petit bourgeois” whose main interest is to increase his own property; on the other hand, indigenous people have never experienced private property as part of their tradition. So, as the facts show, the Suma Qamaña principle doesn’t seem to have become a reality in Bolivian society, that continues to be barely inclusive and careful about indigenous rights. Bolivian people, as several critics show, feel a sense of mistrust for a government that was unable to put into practice a really pioneering Constitution like that of 2009. It represents an innovative attempt to include on a Constitutional level several different cultures, but the reality seems to be still far from what the same Constitution declares. Nevertheless, the principle exists and its teachings don’t stop being an inspiration to everyone who wants to adopt them in her or his daily life. When will the State be truly ready for it?